Hello, parents! Today I have a simple and (practically) free craft to help you get your kids through these hot summer days when you feel trapped inside in the air conditioning, as well as an awesome resource that will help you find dozens of great ideas just like it! If you follow my blog Rub Some Dirt On It, you know that I am huge fan of a parenting website called Modern Parents, Messy Kids. I head there at least once a week to browse through their countless activity ideas for kids of all ages. I am almost always rewarded for my effort with a beautiful craft or easy activity, and today’s post is no exception! I absolutely fell in love with the notion that Every Baby Should Have A Treasure Basket, my one-year-old Emmy included! I am not brave enough to try a sensory box with Jackson quite yet, but maybe once he’s a little older (and a better listener!) I'll be more brave. For now, I'm focusing on entertaining baby girl enough to get some things done once in a while, now that we've entered that frustrating time of I-slept-for-ten-minutes-in-the-car-and-that's-all-the-nap-you're-gonna-get-all-day toddlerhood. I curse this stage, and am often left with a full inbox or a dozen photos left unedited because she is straight-up refusing to take a nap. 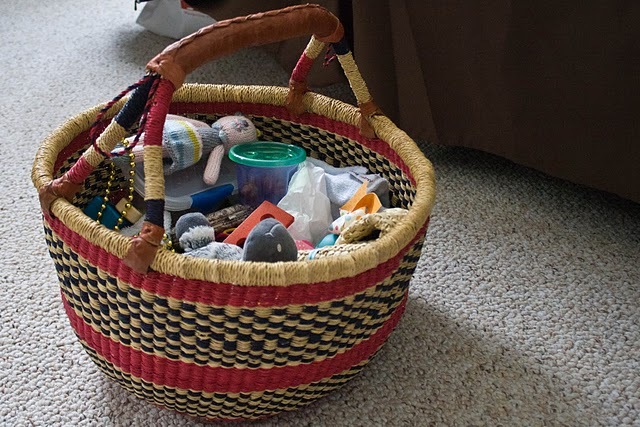 I have pulled out this treasure basket three times this week in the aftermath of Mommy-time interrupted, and it has been a goldmine every time. 1. a basket, or some kind of large container, with or without a lid depending on baby's age. 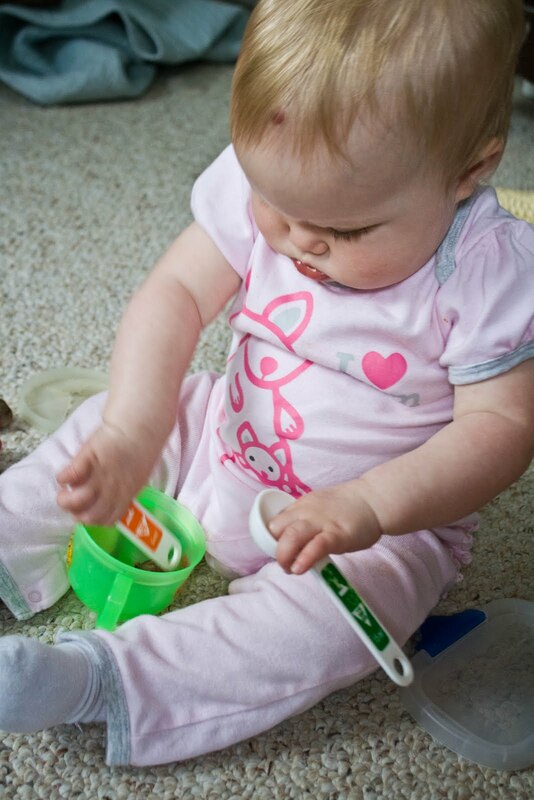 A lid would be a nice challenge as baby gets older and maybe once the novelty of the treasure basket has worn off. I really do think an interesting, attractive container would be better than a plain-old tupperware bin that looks like every other storage unit in your house. This is a "treasure basket." Let's treat it as such. You can go to The Imagination Tree and scope out Anna's treasure box that she made for her baby, but all you need to do is compile some "treasures" that are intriguing to baby's senses, especially touch and sound, and that allow baby to learn and explore his or her world. There is no "purpose," per se. It's all about discovery (and by the way and not surprisingly, this is a Montessori technique)﻿ and you may be surprised which items your baby gravitates toward more than others. I am sure that your 12-month-old would choose different treasures than mine. I'm sure that in 3 months, they would both be attracted to completely new things. As their brains develop, their interests may change. Or maybe Emmy will always go for the jewelry first; we'll see! So, the question remains, how does she like it? I would dare to say that for the amount of effort it cost me to put this basket together, this project is a homerun! Uninterrupted, only partially-supervised fun at our fingertips! I keep the basket in my bedroom so that it doesn't become mundane and something she gets all the time. I won't let her brother play with it; it's something special and all hers, and I wouldn't use it if he was around. Mostly because he's in a monster "mine!" stage, and I must admit that several of the items in the basket are, in fact, his. In order to keep the treasure basket as an entirely positive experience, I want to eliminate any unnecessary drama as possible. Three afternoons this week, after she woke up and Jackson was still napping, I brought her into my room and we played with this on the floor. The first day I was there to participate and observe. She explored happily for 25 minutes, only needing me to assist and explain what certain things were for (like the purse, which has a bit of a confusing clasp). I think she would have played longer had she not needed a snack. The second time we used it she played for 45 minutes with only minor interaction on my part. I sat on the floor with her and made sure she didn't turn any of her treasures into a choking hazard (as you should, as well), but I kept busy on my laptop and she played happily on her own, sometimes just creeping over to show me something that she found interesting. The third time I wasn't on my computer, but she still played rather independently of me for about 45 minutes. 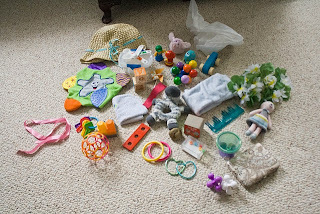 All three times she gravitated toward three things: the girlie things, like the beads, the real-life things, like the measuring spoons, tupperware, and cell phone, and the things she could "sort." This is not surprising given her developmental stage, but I do love when she goes straight for the necklaces and purse! 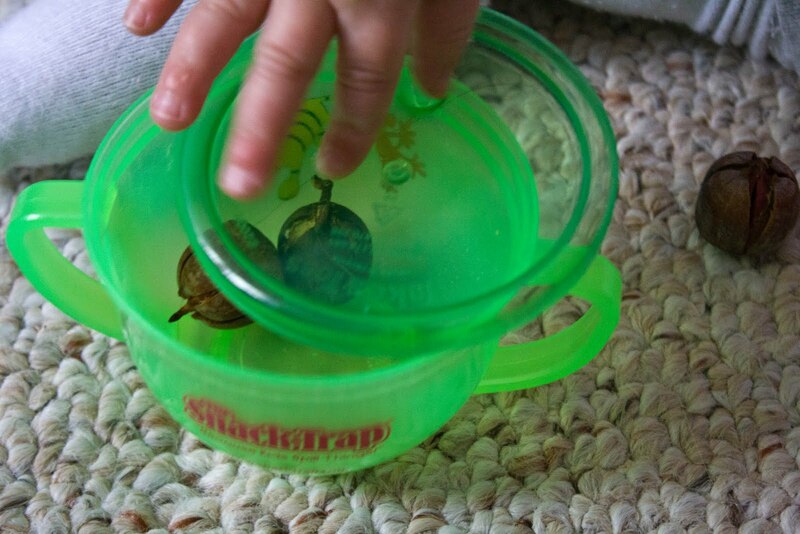 The acorns were a huge hit, because of their unfamiliarity and because they made a very cool sound rumbling inside that take-n-toss container. 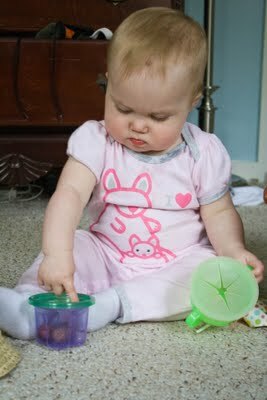 She opened it, pulled them out, put them inside the small tupperware, closed that, and repeat, about 100 times. Then she mixed them with the measuring spoons. She also loved the sound of the beads inside the tupperware. 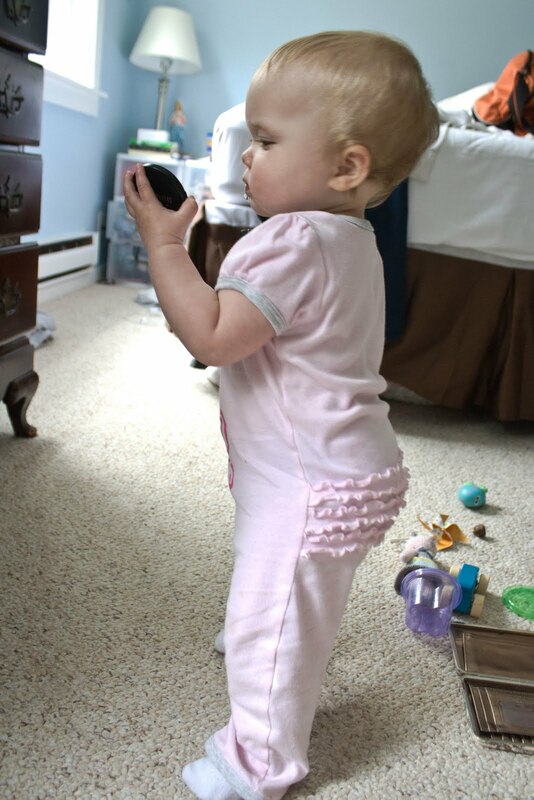 Anything that was noisy was a hit, like the tissue paper or tambourine. And even though I tried to make this basket non-sexist by including traditionally "boy" toys, she didn't even glance at them twice. I wonder if stereotypes are stereotypes for a reason! And next time, I am going to definitely include my spare lens cap. I should have known; every baby's best friend!! 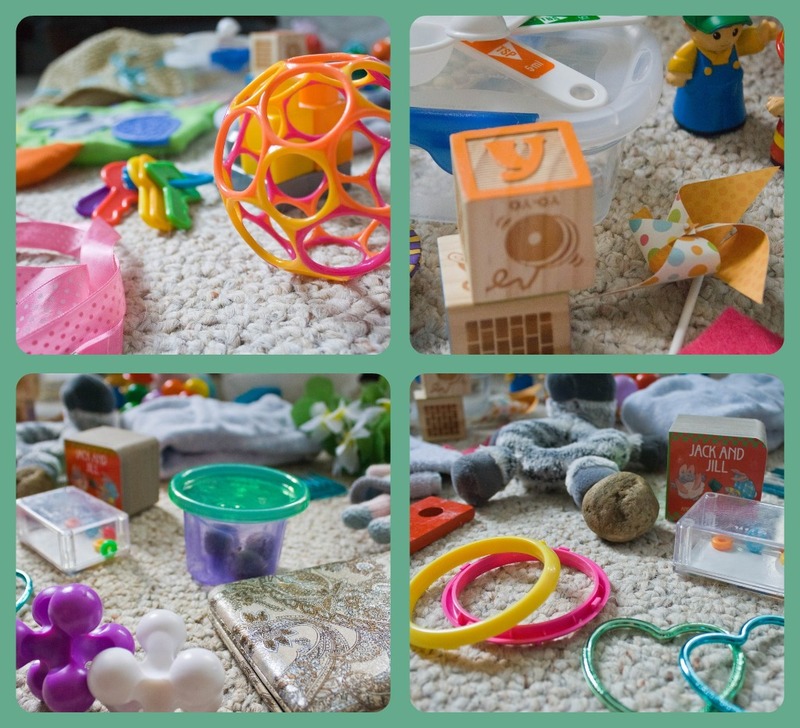 I hope that you will take the ten minutes necessary to create this sensory delight for your 6-18 month old. I promise you it will entertain and educate them, and allow for you to get a few extra minutes to yourself!